What can Animal Chiropractic treat and how do I know if my animal should see an Animal Chiropractor? The only true way to know is to talk to an Animal Chiropractor. The Chiropractor will determine in the consultation whether or not your Animal might be suited to have a Chiropractic exam. Certified Animal Chiropractors in MA will only accept patients under current Veterinary care and will require you to inform your Vet that you are seeking Chiropractic care for your pet. Here is a list of symptoms that your pet may display indicating the need for care. However, checking a dogs spine before they display symptoms and at an early age can help them live a healthier and more active life, slow down the degenerative process in many cases and help to prevent injuries. All animals in Competition should be checked. Any animal that shows unexplained changes in behavior like decrease appetite, moodiness or fatigue, change in gait or stride or lameness should be checked. 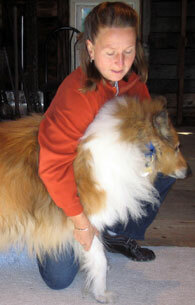 If you think your animal should be checked contact an AVCA Certified Animal Chiropractor. What Should I Expect on a First visit? Dr. Palmer will only treat animals that are under regular Veterinary Care. She works with your Vet but does not replace them. Your first visit consists of a thorough history taking and examination. A chiropractic exam includes a neurological exam, stance and gait analysis and motion and static palpation. If you have had any x-rays or MRI’s taken of your pet you should bring them with you so she can review them on the first visit. If at the end of the examination she thinks she can help your animal she will perform a Chiropractic adjustment, talk to you about a specific treatment plan for your pet and review her findings. She may give you special instructions to follow after the adjustment. Initially, two to four chiropractic adjustments are performed every 7-14 days depending on the condition. Your pet is monitored for any measurable improvement. Based on the type and severity of your pet’s condition, an adjustment schedule is drawn out. Your pet will probably move to once every 4-6 weeks, then once every 3 or 6 months. Young animals that present without symptoms may be checked just once a year. All animals have different initial responses to Chiropractic. It may relax them so much that they sleep for a long time. It may relieve their pain and make them frisky and playful. There may be no obvious change to the untrained eye and hand. Every animal needs to be kept well hydrated before and after adjustments. Travel Expenses (measured from Milford MA) are added to other fees.